Downtown Denver offers a rich, diverse tapestry of business and culture. Bolstered by a vibrant economy and steadily growing population, it consistently sits atop many national rankings for quality of life. 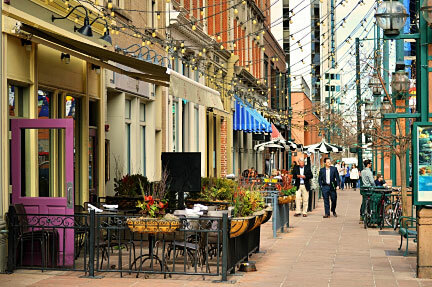 LoDo is one of Denver’s oldest neighborhoods known for its trendy shopping and dining scene. Enjoy Larimer St with its string lights, elegant Victorian architecture, and outstanding dining, coffee house, and entertainment options. Union Station offers an eclectic mix of dining and hospitality. Use the 16th Street Mall shuttle to reach the Denver Pavilions complete with restaurants, retail and a movie theater. There is something for everyone in Denver!